For the warm version of the dish, boil the tortellini and heat the tomato sauce. Mix with a little chopped basil and the baby mozzarella balls. For the cool version of the dish, boil the tortellini, drain and let them cool down. 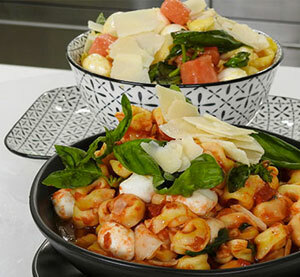 In a bowl combine the tortellini, the tomatoes, the baby mozzarella balls, the basil and a little salt in flakes. Beat separately in another bowl 6 tablespoons of olive oil with the mustard and balsamic vinegar. Sprinkle with chopped basil and parmesan flakes.